This week’s notable number is seven — the number worn by quarterback Shane Buechele and safety Caden Sterns. Lil’Jordan Humphrey’s seven touchdown receptions lead the seven Longhorns who have caught a touchdown this fall. Texas is 7-1 against Iowa State in games played in Austin. Seven also accounts for the number of times that a freshman quarterback has lost to a Todd Orlando-coordinated defense since the start of the 2014 season. No. 15 Texas (7-3, 5-2 Big 12) hosts No. 16 Iowa State (6-3, 5-2) in its final home game of the season. The Cyclones are quarterbacked by freshman Brock Purdy, who is 5-0 as a starter. The 6-1, 202-pound Purdy was rated as a three-star prospect in high school. Following Kyle Kempt and Zeb Noland, Purdy is the third quarterback to start for Iowa State. In his five starts, he’s thrown for 1,315 yards and has averaged 3.8 yards per rushing attempt. Of his 121 passes, 83 have been completed and two have been intercepted. Over Purdy’s five starts, Iowa State is averaging 34.6 points. Purdy will be the third freshman quarterback Texas has faced. Redshirt freshman Kasim Hill led Maryland past the Longhorns in the season opener. 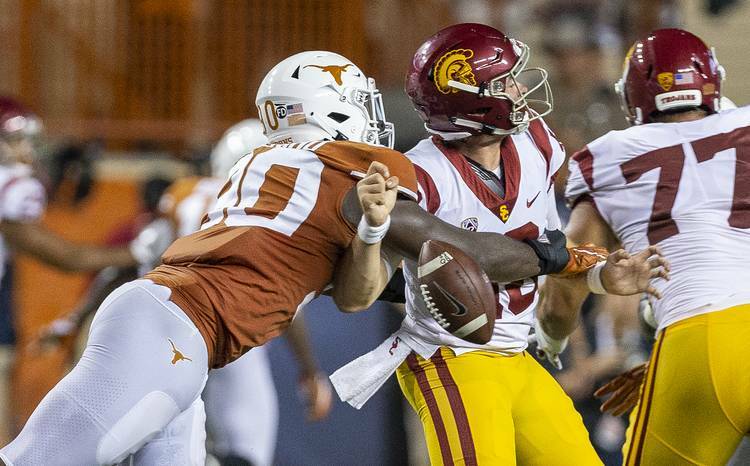 Two weeks later, the Longhorns beat USC and the Trojans’ freshman quarterback, JT Daniels. Over the last five years, Orlando — running the defenses at Texas, Houston and Utah State — has game-planned for nine freshman quarterbacks. His teams are 7-2 in those games (Maryland this year, SMU in 2016 while at Houston). The Cougars held Louisville’s Lamar Jackson to 168 passing yards, 16 rushing yards and two total touchdowns in a 34-31 win in 2015. In those nine games, freshmen quarterbacks have gone 142 of 270 for 1,630 yards, eight touchdowns and 10 interceptions. They’ve been sacked 17 times. Only New Mexico’s Lamar Jordan topped 25 rushing yards. Texas has allowed 19 touchdown passes this year, but only one by a freshman. Purdy has thrown 13 touchdowns; four of those were thrown against Oklahoma State on Oct. 6. Iowa State coach Matt Campbell said Purdy’s humility and desire to get better have allowed him “to continue to improve each week.” On the field, Texas linebacker Anthony Wheeler said he noticed that Purdy’s ability to pump-fake has created problems for defenses. Texas defensive end Charles Omenihu described the entire Iowa State offense as deceptive and complicated.